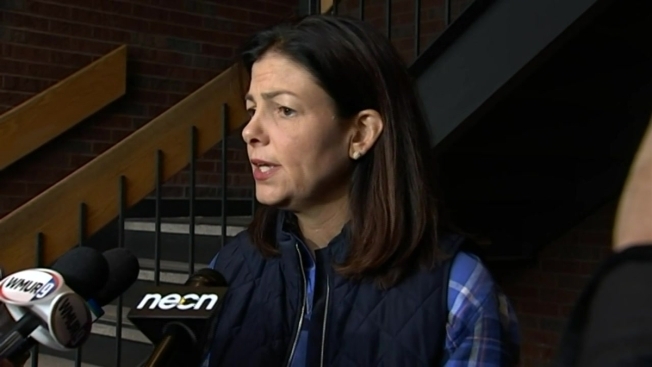 Senator Kelly Ayotte met with reporters Sunday at the Manchester Fire Department, trying to distance herself from the latest Donald Trump controversy. "He's talking about assault of women," said the Republican Senator from New Hampshire. A video surfaced Friday, showing Donald Trump caught in a hot mic moment from a 2005 Access Hollywood video bragging about groping women. "And I thought years from now, when my daughter Kate is old enough to know what is in those tapes and to understand what she is talking about, I want her to know where I stood," said Ayotte. Last monday, during an necn debate, Ayotte said she believed Trump was a good role model for children. Hours later, Ayotte walked that back and said she mispoke. With her U.S. Senate seat up for grabs and the polls showing she's vulnerable, her democratic challenger New Hampshire Governor Maggie Hassan pounced on the opportunity. "Republicans who have been standing with Donald Trump for a better part of a year, can't make any excuses," said Hassan. Hassan is already putting out attack ads using parts of Ayotte's debate performance and this latest trump video. However Ayotte says she won't be defined by this moment, hoping the flames from this public relations inferno, won't burn down her campaign. Polls show this Senate race is a toss up, with less than a month to go until the election. Ayotte says she's now voting for Trump's running mate Mike Pence, as a write in candidate.